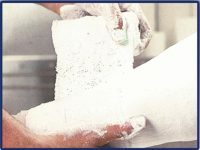 A ready to use kit provides non-invasive traction for non-operative fracture or post-operative limbs, including all items needed for the safe application of sustained traction weight support and suitable for use with a variety of traction methods. Fabric strapping coated with hypoallergenic hot melt adhesive. 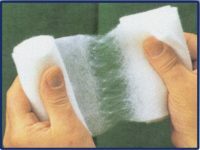 Foam padding attached to the middle of the strap for cushioning effect at the malleolar region. Plastic spacer block (suitably drilled for cord attachment). High performance elastic bandage reinforces retention and aids effective traction. High conformability for easy application. Breathable foam liner to cushion and protect bony prominences. Skin traction kit used to gain and maintain bone alignment, in the case of a fracture, dislocation and to correct mild deformity. Low Allergy Adhesive Skin Traction Kit for long term effective traction. Do not apply skin traction kit to skin with abrasions, lacerations, surgical wounds, ulcers, loss of sensation or peripheral vascular disease. The adhesive strapping is applied to the inner side of the leg, beginning from just under the knee, the unrolled further to allow placement of the foam at the malleolar region and the spacer under the heel, and finally the strapping is applied to the outer side of the leg. 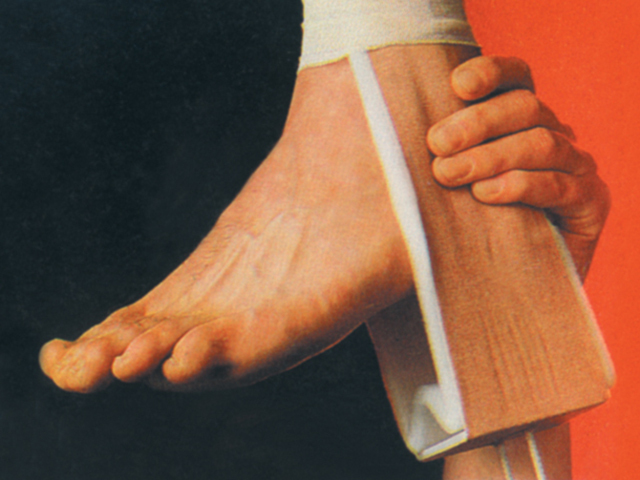 Creases and folds should be avoided at the adhesive strapping to prevent skin blisters. In case of creases, the crease should be lifted up, slit and overlapped. Apply the overlying elastic bandage spirally, overlapping by half.